International Shipping charges will apply to international orders which include textbooks. To request an international shipping quote, please send your shipping address and desired quantity to utt@summit.org. Only textbooks ordered with licenses are eligible for package pricing. Textbooks ordered apart from licenses are not eligible for the package rate. To purchase textbooks without licenses, click here. Order and Set-Up Instructions can be downloaded here (PDF). 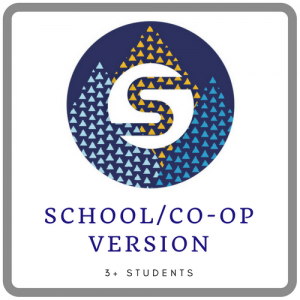 For Homeschool Co-ops: If you are part of a co-op with a more traditional-school layout (i.e., one teacher overseeing the course and 3+ students in attendance), multiple class sections, or 2+ class times per week, then the School/Co-op Version will serve you best. For Single-Family Use: Pick the Homeschool Version. 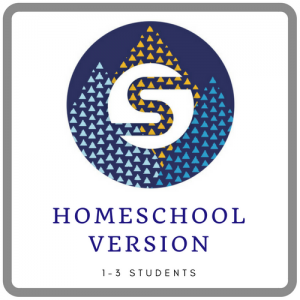 The material is the same for the teacher in both the Christian school and homeschool versions, but the school administrative set-up process is bypassed for homeschool use; just add your students and begin! Assignments for a homeschool are distributed weekly. Please watch the comparison below if you are uncertain which version will fit your needs. Further homeschool vs Christian school comparison information can be found here. Looking for the printed curriculum? Available through www.Summit.org/store. Will ship in late May. To compare the print and digital formats, click here.